- Just two weeks after Antonioni's death, his native city of Ferrara have announced that the museum that shares his name and houses his archive is to be permanently closed due to a lack of funds. I guess now is the right time for them to try this trick and manipulate sympathies, and if it safeguards the archive, then fair enough. - Fox is offering a points deal to the Writers Partners crew in order to lure in more of their spec scripts. This includes Michael Arndt, the Wibberleys and John August, not to mention a whole load of folk that film ick are rather less interested in. - Len Wiseman has been confirmed as the Escape From New York rehash director. A crying shame. - The Gatchaman and Astroboy films are on schedule for 2009, where they'll be represented by a toy range from Wowwee. - Michael Cera has been given the lead role in Youth in Revolt, scripted by Charlie Bartlett's Gustin Nash. - Open Water's Chris Kentis and Laura Lau are reteaming for their next film, a legal thriller warped with paranoia and anxiety. - Tarsem (Singh) is to direct The Unforgettable. It's based on a video game and features a cop who discovers he isn't quite as human as he assumed he was and ends up caught in war between aliens hiding out on earth. If it's one half as good as God Told Me To, I'll eat my shoe. And let Les Blanks film me doing so. - Brian Horiuchi and Matt Lazarus have been hired to write a reamke of Isle of the Dead, this time set in Afghanistan. It sounds rather similar to the.Virgin Comics' film Virulents I hope they call it Isle of the Dead Too. Maybe. - John Turturro is to self-distribute his film Romance and Cigarettes in the US. It'd be nice to support Turturro, and even self distribution, but honestly, this film is awful. Don't go anywhere near it. At all. It's virtually toxic. Badly cast, shockingly ill-conceived, terribly directed, scripted without even a smattering of wit or lightness and nauseatingly designed, this was one of the most dreadful films of the last few years. The DVD can be purchased cheaply from the UK, and if you have to - absolutely have to - see a musical love scene between a scantily clad James Gandolfini and breast-swingin Kate Winslett, that's a better option than being caught watching this disaster in public. - Hollywood Chicago have details of a big building implosion that is set to appear in The Dark Knight. - Ryan Craig's Small Town Saturday Night is picking up cast members: Chris Pine, Bre Blair, Lin Shaye, Brent Briscoe, Muse Watson...heard of any of them? Maybe this will be a starmaker for undiscovered talent. - Nat Christian is writing 700 Hill, the first film from the fledgling indie production outfit Monterrey Pictures. - Is Kevin McKidd going to play Thor? For his sake, I hope so thought the upcoming WGA strike might cause some problems. I was only discussing him a couple of days ago - not quite understanding why he wasn't in Sweeney Todd. - Or, on the other hand, is Thor to be played by a WWE wrestling star called Triple H? Chud apparently thought it was possible - but now their story appears to have vanished. Because they're embarassed? oO because Marvel are? Chud had claimed that Marvel and Matthew Vaughn were arguing over the casting. - Talking of Marvel, Genndy Tartakovsky is to satirise their 70s era comics in a Luke Cage miniseries for the publisher. - Summer Glau has discussed The Sarah Connor Chronicles, in which she plays a futurebot cyberwoman terminator thing. - IESB have alleged that a live action Dr. Strange film is imminent. What they didn't mention was the attempts to get Alex Proyas to direct that have been heard in the whispering undergrowth. Maybe he's already turned it down? - Victor Navone has spoken to JV Pixar. - Nobody seems to be reporting it yet, but film ick favourite Richard Briers will be in the next series of Torchwood playing a reclusive millionaire called Parker. He's hiding some secrets - alien ones. 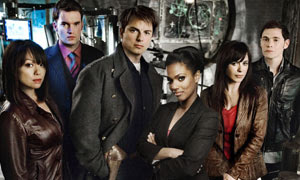 Here's a look at the new lineup with Martha Jones added. Wha-? Last I heard from you and around was that Proyas was being courted for Silver Surfer... Now he's suddenly being pursued for Dr. Strange? I wonder if Marvel brought each one to him, and is letting him pick... or perhaps he turned down Surfer, and they are trying again with Strange...? Either way, I'd be a happy bunny if he took either! I have no idea how true any of this Alex Proyas business is, not personally. But I hear rumours and I'll happily report them as such.